The Product element is another famous element. Based on that fact, Zuperla really offers multiple options for this element as well. Let’s see them briefly, starting with the basic styles. Product Mode: Select your Product Mode. Grid Image Size: You can select your product image size among Square Small Crop, Landscape Small Crop, Landscape Medium Crop, Portrait Small Crop, Portrait Medium Crop, Resize (Large), Resize (Medium Large) and Resize (Medium). Large Screen Columns: Select your Product Columns among 2,3,4 and 5. Columns: Select your Product Columns among 2,3,4 and 5. Items to Show: Type the maximum product items you want to show. Product Title Tag: Select your Product Title Tag for SEO. Product Title Size/Typography: Select your Product Title size and typography, defined in Theme Options – Typography Options. Second Image Effect: Select it if you want to have second image effect. Filter: If you selected it, an isotope filter will be displayed. Enable Product Filter (Only for All or Multiple Categories). You can select your filter order, style and alignment. 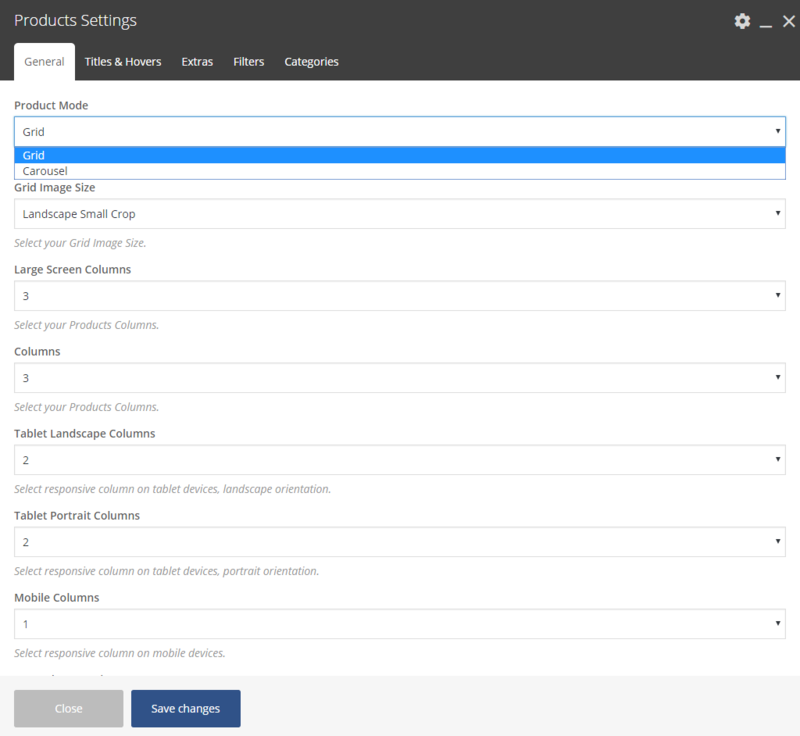 Product Categories: Select all or multiple categories. Product: Select your Product Mode. Carousel Image Size: You can select your product image size among Square Small Crop, Landscape Small Crop and Portrait small Crop. Items to Show: Type the maximum products items you want to show. Slideshow Speed: Enter the speed of your slideshow in ms. Pause on Hover: If you select it, the carousel will be paused on hover.